Just wanted to review this mod. Last year at Gingerman, I lost 2 quarts of oil. I couldn’t believe it. Fast forward to to this year. Just came home from gingerman and I didn’t have to add any oil to My car the whole weekend! I mentioned to my buddies that they will go though at least a quart of oil without this mod and they sure did! I did did add a catch can as well and about a little less than 1/4 of a quart came out, but that’s pretty common with doing 15 sessions in a weekend. As you can see, I did not remove the baffling when I drilled my holes. After drilling the holes, the first thing I did was use a deburring tool to deburr the backside of each hole. I then proceeded to flush out the valve cover religiously. First I rinsed with water and detergent, then performed another flush with hot water, then finally hit all the holes with compressed air and gave things a thorough drying. After each flush I also used a strong magnet around each of the holes to try and grab any lingering swarf. Anyways, just wanted to share my slightly different version of this mod! If anyone is on the fence about this mod, just do it! The smokescreen problem is a major issue at Harris Hill Raceway in San Marcos, TX which is the track I frequent the most. Specifically, it happens at Turn 10 which is a tight hairpin and happens with both AP1s and AP2s. Initially when I first started tracking three years ago, it was not an issue but as my skill level increased and I was taking the corner faster, I started to have the smokescreen, the car would lose power and I was burning almost a quart of oil for every two sessions. I told myself I could not keep running this track unless I solve the issue and get the valve cover mod done. Well two weeks ago, I sent Dustin my valve cover a week before my track day. I let him know that I was in a time crunch since was sending him the original valve cover as I did not have a spare to send him. 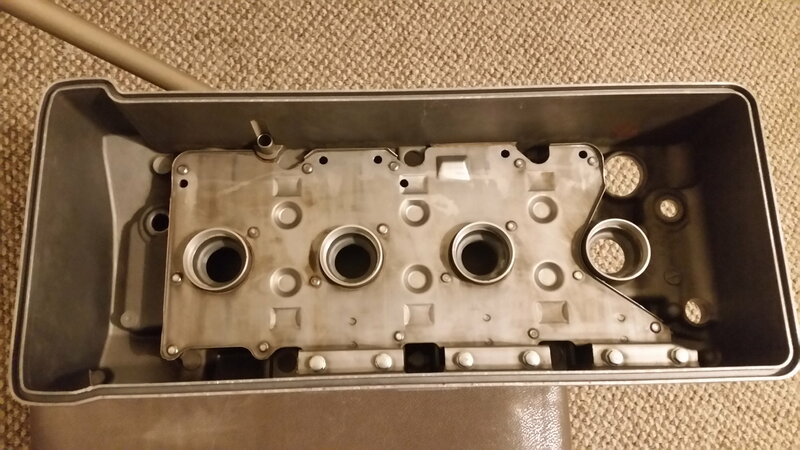 He received the valve cover, performed the mod and had back in the mail within 2 days! That weekend, I was able to get the valve cover on and I made my track day at H2R a few days later. Smokescreen issue gone FTW! And I only burned 1/4 of a quart (if that) of oil through all 3 of the sessions which I would consider to be normal for a tracked car. I highly recommend this mod to anyone who tracks their car and dealing with Dustin was super easy. Powder coated valve cover problem. Valve Cover/PCV Valve main cause oil consumption?